Constructed in 1870, the Salem County Insane Asylum is the only known surviving example of a first-generation county insane asylum in New Jersey. County asylums were constructed in response to the lack of state action to address overcrowding in state-run facilities in the late-nineteenth century. Gloucester County was the first in New Jersey to build a county-run asylum in 1869, followed by Salem and Cumberland Counties in 1870. The County Farm, as Salem’s asylum complex became known, was the site of county institutional poor relief as far back as 1796 up through 1951. The third county almshouse, demolished in 2007, was constructed there in 1845, and the asylum was situated adjacent to it when it was constructed. The asylum was designed as a three-story, three-bay-wide Italianate cube. It is a brick building with a square, wood belvedere centered at its roof. It was designed to compliment the former adjacent almshouse in height, proportion, and fenestration, but was much smaller. The asylum retains remarkable integrity, including its original center-hall plan; each floor features two large front rooms, a center hall, a small rear room, and a rear stair hall. This “three-story cottage” plan was promoted at the time as an alternative idea for treating the insane. The Salem County Insane Asylum served its original function until 1925, at which time the people it housed were moved to state-run institutions. The building continued to serve as ancillary space for housing the poor until 1951 when the county converted it and the almshouse to a certified nursing home. In 1971, the county relocated the nursing home to a different facility and the insane asylum/almshouse complex was used to house various county and non-profit offices. The buildings were not well maintained and by 1995, all offices moved out due to deteriorating conditions. A lack of attention and funding allowed the vacant asylum and almshouse to deteriorate until 2004, when the county initiated planning for a stabilization project, including New Jersey and National Register listing for the complex. It appears that no stabilization work had been completed by 2007, when a section of the rear wall at the third story of the almshouse collapsed, prompting its demolition that same year. The asylum was successfully listed on the New Jersey and National Registers of Historic Places in 2008, and at that time the county performed “bare bones” work to secure the building. The county did recently repair some roof damage at the asylum, but the building continues to sit vacant without any known plans for its future. While no one openly opposes the building’s preservation, there is also no organized effort to save it. The Salem County Inane Asylum is significant as the only known surviving example of a first-generation county insane asylum. The building exemplifies the nineteenth-century nationwide trend of institutionalizing mentally ill persons separately from other classes of poor people and embodies architectural experimentation driven by the then-revolutionary idea that that the environment in which the mentally ill were housed was an important element of their treatment. It provides a rare ideal opportunity for the recognition of a unique, lesser-told element of Salem County’s and New Jersey’s diverse history: the story of our mentally ill. The longer the Salem County Insane Asylum is left unused, the more likely its eventual deterioration to the point where preservation would no longer be feasible, becomes. 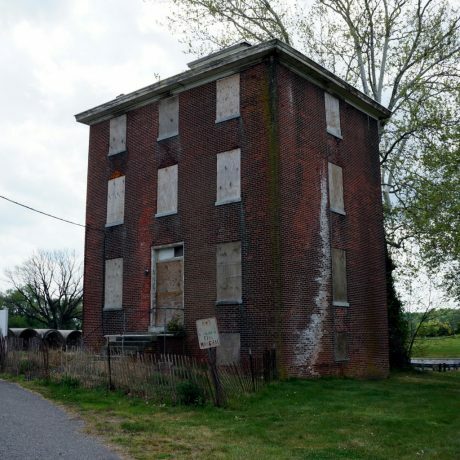 As a result, the key to this building’s preservation is finding a viable, long-term use that will prompt Salem County to invest in its restoration and rehabilitation. The County Farm, as the complex which includes the asylum, is still known today, is the site of many county functions including the jail, road department and fire training center, among others. As such, the building’s location provides an ideal opportunity for adaptive use. Salem County recently restored its historic courthouse through a Garden State Historic Preservation Trust Fund grant, which demonstrates that they are preservation-minded; Preservation New Jersey urges the county to look at this project as a model to generate greater awareness of the asylum building and a concerted effort to develop a viable plan for this landmark’s preservation.